This recipe is barely a recipe, which makes it great for those of us made lethargic but still thirsty by the ever-present summer heat. The caramel takes about 20 minutes, start to finish, and you don’t even have to turn on the oven! Genius. Let’s begin by making some caramel sauce! In a small pot, combine the sugar and water. Place over medium-high heat and let it cook until boiling, without stirring, for 18-20 minutes. While it boils, you can swirl the pan if you like, but no stirring! Toward the end of the 18-20 minutes, the sugar mixture should turn a dark amber color, and the bubbles on the surface will become much smaller. Some smoke coming up from the pan is normal, never fear! Heat the heavy cream in the microwave on high for 1 minute. As soon as the time is up on the caramel, remove the pot from the heat and slowly pour in the hot cream while whisking to incorporate. Add the butter and vanilla, and whisk the caramel until it’s smooth. It’ll be too hot to use immediately, but you can pour it into a bowl and let it chill uncovered in the fridge for about 30-40 minutes. 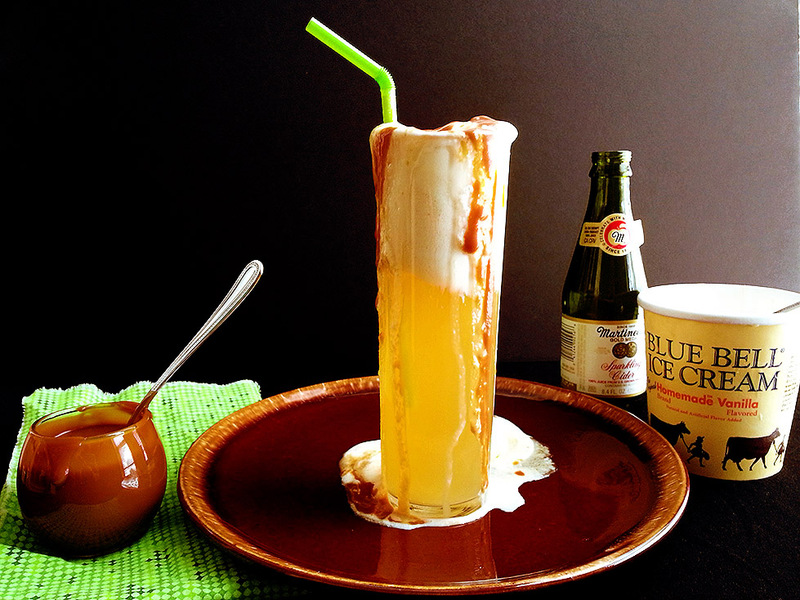 Once the caramel is cooled, grab 3 tall glasses and pour about 8 ounces of sparkling cider into each one. Top it off with a hefty scoop of vanilla ice cream, and drizzle on as much of the cooled caramel sauce as you’d like! It’s easy refreshment for the impending hot summer days (and nights!) that’ll make you wish for Fall’s impending return. Enjoy! Dropping by to say hello! OH the autumn spiced donuts with apple curd filling is driving me nuts! And since I’m not a beer drinker, this is a perfect option for some soccer game watching this season! Hello!! I’m not a beer drinker either, so it was a natural pairing for me. So glad you’re enthralled by the cider donuts! I hope you make ’em, they’re unbelievable. Thanks for stopping by, Mandy!